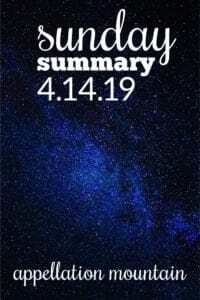 Katie Bouman photographed a black hole, a feat never before accomplished in all of human history. Okay, not just Katie Bouman. But in a field dominated by men, Katie – who holds a PhD in computer vision – went viral after a post showed her delight at her team’s success. Last weekend, my daughter’s scout troop – about a dozen 10- to 12-year old girls – visited NASA Goddard. The gap between those middle school girls and Katie has never felt smaller. Which has what to do with names, you ask? We often focus – and rightly so – on finding strong names for our daughters. Nothing too cutesy, we insist. We’re raising future women of dignity and accomplishment, not aspiring pop stars. But it’s still a tiny sliver of all the names. Katie, as it happens, does not appear on these lists. Neither does Nancy (Pelosi) or Ginni (Rometty, the CEO of IBM). Continue to name women of accomplishment, and you’ll quickly see that while there are Ruths and Marys and such sprinkled among them, plenty of women wear names that we’d never associate with their positions of power and influence. Our fictional Secretary of State is named Elizabeth. But in reality? Condoleeza works, too. And while yes, Katie Bouman is actually Katherine Louise, she hasn’t felt the need to shed the cute Katie to succeed in a male-dominated field. So maybe the problem isn’t the names. Maybe it’s our perception. Do we hear traditionally feminine names and think that Arabella or Evie or Gianna or Lula can’t possibly be a CEO or a successful politician or a scientist who breaks new ground? Because Katie reminds us that it’s very possible. This is fascinating: parents in India seek meaningful names with Sanskrit roots, but often don’t understand the language well enough to make an educated choice. So they turn to the internet where the accuracy of information, erm … varies. (And yes, I include myself in the “varies.” Even when you’re conscientious, it’s easy to make mistakes.) Sanskrit remains an official language in India, but I’d guess it’s probably akin to Latin. Many of us know some phrases, but it’s pretty thin knowledge. Of course, there’s more than one way to think about meaning when it comes to names. I’m not on board with naming your kiddo Lucifer – religious beliefs aside, it’s a jaw-dropping, conversation-stopping spotlight of a name – but I’m curious about Mazikeen, maybe because Maze is a) downright cool and b) perfectly on trend. Sophie’s list of sound-alike girl names is just great! Especially helpful because not only is Isla more popular than you might think, it’s likely to be misheard as Lila and Delilah. Worth considering! 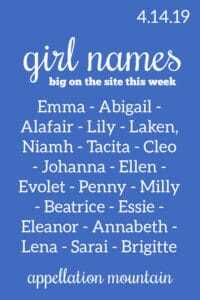 Because I can’t resist Polish baby names, here are the new favorites for girls. And boys. A good look at namer’s remorse from Laura Wattenberg. In the UK it we are more accepting of nickname style or diminutive names. I don’t find Katie at cutesy. Poppy, Daisy, Tillie, Kitty, Lulu, Cissy, Honey, Buddy, Mikey, Bear seem over the line into cutesy to me. Freddie and Janey are on the line, perhaps, but Katie, Tommy, Davy, Jimmie, Sally, Frankie, Mandy, Abbie etc – we’re all very comfortable with those as adult names on respected people here, in my opinion. It’s all subjective, of course… Any other UK or Australian perspectives? I am also a Katherine called Katie. When I was naming my daughter, my dad had objections to the nicknamey ness of her name (she is just Kit) because she wouldn’t have anything “professional” to fall back on. But I just looked back at my own experience. I have never felt the need to use Katherine in order to be taken seriously or further myself in the work force. I loved looking through the Polish names! My family has Polish ancestry and my husband and I are using only family names for our children. 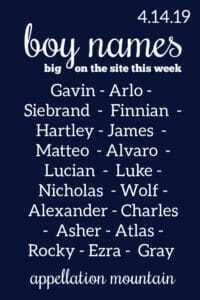 It was fun spotting the original versions of my son’s first and middle names on the boys list. As well as, interestingly, our boy name if #2 is a boy that’s from a different and decidedly not Polish branch of the family. We have two contenders for girls names and they’re both represented on the Polish girls list while they’re both absent from the US top 1000 as of last year. I had no idea our choices were so mainstream … if we lived in Poland. My husbands last name—Orla—means “golden princess. He’s very blonde. Brought that one out at a party and we all got a good laugh!